Marco Fabián scores on Toronto FC on a penalty kick on March 2. 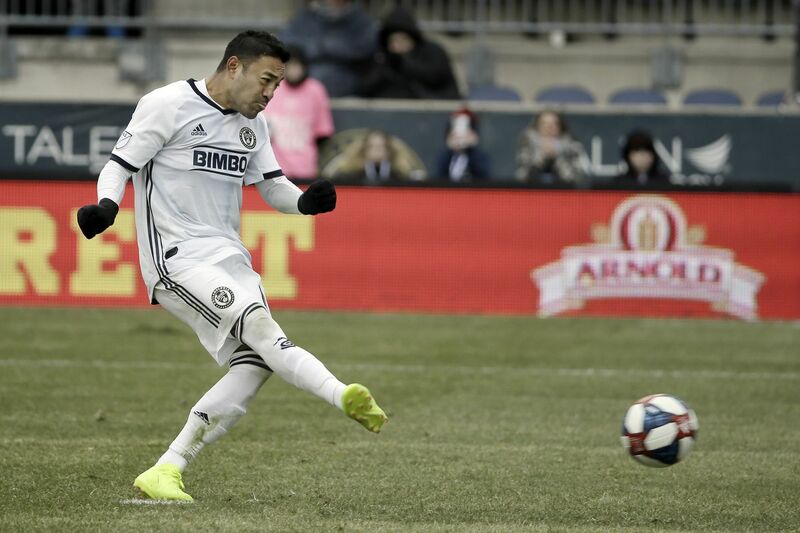 The Union won’t appeal the red card Marco Fabián was given in Sunday’s 2-0 loss at Sporting Kansas City, meaning the star playmaker will miss this coming Sunday’s game at Atlanta United. Fabián was sent off for landing studs-first on Kansas City winger Johnny Russell’s right wrist after jumping into the air to avoid Russell’s slide toward a loose ball — and, replays showed toward Fabián. Referee Chris Penso initially called Fabián’s infraction a regular foul, but the video replay booth — VAR, officially, short for video assistant referee — judged it worthy of ejection. “That was a point of emphasis from the officials this year, stepping on a player, so it’s something that realistically, we probably don’t have a good chance of winning,” Union manager Jim Curtin said Wednesday. Each team gets two unsuccessful appeals of red cards per season. It would have been a gamble to lose one after just two weeks. That doesn't mean Curtin is satisfied with the decision, though. Far from it. "If it turns into now that VAR is something where we're searching for fouls, and going to video and pausing it, I think almost every slide tackle or tackle can look bad if you pause it at the right moment," Curtin said. "I think Russell actually arrives early [and] actually fouls Marco. He's off balance, I don't know where he can put his foot." Curtin said "we have a good idea" of who will replace Fabián in Atlanta, but wouldn't give a name. Brenden Aaronson is the leading candidate. It would be the 18-year-old Medford native's first game in MLS. Sergio Santos has yet to show what he can do in a full game, and he won’t get the chance to for a while. The Brazilian striker suffered a Grade II hip flexor muscle injury during Tuesday’s practice and is out for at least four weeks. Centerback Mark McKenzie was back on the field after missing the Kansas City game due to a concussion suffered late last week. Curtin said McKenzie is "fully cleared." Ilsinho went down hard during a scrimmage in Wednesday’s training session after getting stepped on by a teammate. He walked off the field under his own power, but didn’t look good. He was to undergo further evaluations Wednesday afternoon. Haris Medunjanin didn’t record any tackles or any interceptions in the Kansas City game. Though he created two chances and completed 41 percent of his 50 pass attempts, that lack of defensive contributions from a defensive midfielder is glaring. In fact, as Curtin noted Wednesday, Medunjanin often played higher up the field than left-sided central midfielder Warren Creavalle. It was the second straight game in which Medunjanin earned a fair share of criticism, after a bad outing in the season opener against Toronto FC. Soccer formations are more fluid than they usually look on paper, but Curtin said Creavalle playing behind Medunjanin so much isn't how the Union's setup is supposed to work. Jim Curtin noted today that against Kansas City, Warren Creavalle often was positioned farther back on the field than Haris Medunjanin. Here's some proof of that: the players' touch maps in the game. The way our setup is, if the ball is on Ale [Bedoya]'s side [of the field], we still do want Warren and Haris to both be there together. What we don’t want is for them to drop deeper and now be in the back line. If Warren is pulled out to his side, and has to go into a wide area, then the pivot switches and Ale and Haris are next to each other [centrally]. So there’s always two there to cover. There’s very few systems in the world where one guy does all that running. You’ve talked about [how] Haris’ strength isn’t his defense — I know that, Haris knows that as well. But he still is incredibly intelligent, he knows where to be to break up plays, he knows how to start our attacks. The least of our concerns right now is Haris. If you walk through the game, in the first 45 minutes he also set up every chance that we had. Literally every one was from him. So, you take those away and then we’re just packing it in and sitting back. We’re a team that’s going to attack together and defend together. It’s not one person, one way or the other. In theory, I know it’s a diamond and it’s one [player at the base], but when we’re in our defensive third, it always has to be two [players]. The moments that we’re late with that, we’re going to get punished. This weekend will be an example. When you have [Ezequiel] Barco and Pity Martínez who come inside, and Josef Martínez trying to stretch your two centerbacks and occupy them, that’s when the spaces get big in that area of the field. Whoever we choose to play on either side has to really be willing to slide fast. Because if you fall asleep one time, you get punished. I get your question, for sure. I also know that you’ve put some blame on a really, really high-quality player that I think highly of. That’s part of it, and it’s a fair question to ask. But I think we have a lot of things as a team we can still improve.